The announcement comes at a time when global governments are putting pressure companies to play their part in reformulating products and cutting down on sugar content to tackle childhood obesity. The factory in Smithtown on the Lower Macleay of the mid-north coast of New South Wales, where Milo was first created, has scaled up its production of the new addition to the range, Milo 30% Less Added Sugar, which will be hitting shelves in May. The product contains malt barley, milk powder and cocoa – like the original – but replaces cane sugar with stevia for sweetness and soluble corn fiber for texture, to give a new version that looks, tastes and behaves like the original product. 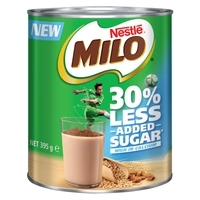 It is priced at AUS$6.99 (US$5.02) and will hit the shelves in early May 2019, alongside the original Milo range. “From the very beginning of development, our focus was on creating a product that both tastes and behaves like the original Milo,” McIver says. “That means not just keeping the same core ingredients of milk powder, cocoa and malt barley, but also making sure it looks the same, tastes great and has crunchy bits on top,” he continues. Sugar reduction and reformulation are high on the agenda. In the UK last May, Nestlé unveiled an innovative sugar reduction technique that was hailed as a scientific breakthrough because of the way it “restructures” sugar. Researchers from the Swiss giant pioneered the “Milkybar Wowsomes” range, describing this as the first chocolate bar in the world to use Nestlé’s innovative sugar reduction technique.